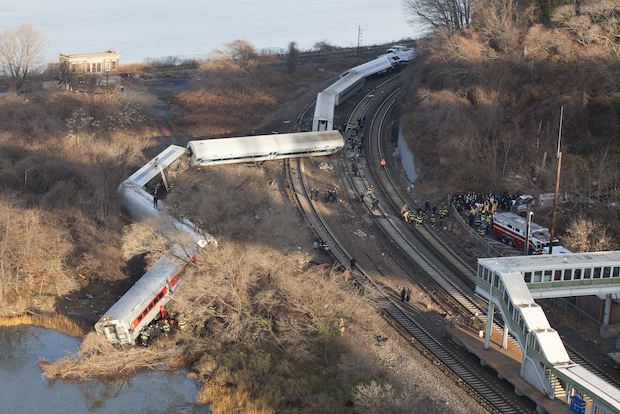 MANHATTAN — Investigators believe the motorman at the controls in the deadly Metro-North Railroad derailment in the Bronx Sunday dozed off for a few fateful moments and woke up too late to stop the speeding train from hurtling off the tracks, DNAinfo New York has learned. Veteran engineer William Rockefeller all but admitted he was falling asleep as the train came roaring to a curved section of track north of Spuyten Duyvil in statements made shortly after four people were killed and dozens were injured in the wreck, sources said. He apparently woke up just as the train, traveling at 82 mph, was heading into a precarious curve that called for the train's speed to be reduced to just 30 mph. As the train entered the curve, sources said, Rockefeller was jolted from his sleep and hit the brake, but not in time. The cars derailed, and several careened onto their sides before grinding to a halt on the edge of the Harlem River. Four people were killed, three of whom were thrown out of the cars, and more than 60 others were injured. Rockefeller, 46, has been an engineer for roughly 11 years and a Metro-North employee for 20 years, and has an unblemished record. Sources said he took a drug and alcohol test, and they do not believe either was a factor in the crash. They declined to provide details of Rockefeller’s statements, which were given within minutes of the disaster, when paramedics and investigators arrived at the scene to offer assistance and try to learn what happened. Prosecutors subpoenaed Rockefeller’s cellphone, but sources said they do not believe he was using it at the time of the tragedy. Instead, sources said he virtually admitted that he fell asleep as the train roared through a straight, 70 mph zone, heading toward one of the sharpest curves on the 75-mile trip that started at 5:54 a.m. in Poughkeepsie, bound for New York City. They believe the rumbling of the train roaring through the head of the curve awakened Rockefeller and he hit the brake immediately. National Transportation Safety Board member Earl Weener said at a press conference Monday the brakes were engaged, but “very late in the game” — only six seconds before the crash. And he would only say it was unclear if the speed was the result of human error or faulty equipment. Sources could not immediately explain why Rockefeller became fatigued as he neared Spuyten Duyvil. They said they had no initial reason to believe he had been overworked or was out late the night before. Rockefeller was among those released from the hospital Monday. He remained in seclusion as the crippled trains were being righted and placed back onto the tracks, which were also being repaired Monday. Union officials said Rockefeller was thoroughly traumatized by the tragedy and was cooperating fully with investigators. Friends and colleagues described him as a sincere, hardworking man who was always serious and responsible about his job. The NTSB has been urging railroads for decades to install technology that can stop wrecks caused by excessive speed or other problems, including those that can automatically slow trains through curves. Metro-North has been trying to make the costly purchase and install the equipment.